Chuck is a highly charismatic server at Papa’s Wingeria. Before he won a job serving wings, he was a small-time model from Tastyville. Chuck mainly did photo-shoots for stock photos and clothing stores. 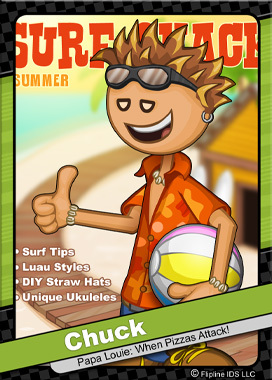 Many recognize him as the face of the Surf Shack's summer catalogues. At first, Chuck was bummed about his new cooking job. However, once the tips started rolling in, he quickly changed his tune.